Perkin >> Blog >> Knives >> Bust all Myths about the Old Wives’ Tales of Knives this Christmas! Are you too superstitious about gifting knives? Do you think it brings bad luck upon the giver and receiver? Have you been hearing such stories from your mother and grandmother ever since? Well, if you answer yes to most of the above asked questions, we don’t blame you! But it’s Christmas, and you are wracking your brain, trying to come up with the perfect affordable, useful, and thoughtful gift! This season is all about making the people in your life happy, and what if the knife is the key to that? What if this gift enhances the spirit of the holiday season, and makes it merrier for both you and others? It’s more so when your friends and family include outdoor enthusiasts, culinary aficionados, and survivalists etc. That’s when you should ditch the superstitions, and do what it takes to make this Christmas even more joyful for them. The superstitions: These are pre-historical and common beliefs all over the world. From China to Europe, people believe that gifting a knife shall cut the friendship between the individuals involved. Also, a pocket knife should only be gifted to someone when it’s closed, or else it can cause an argument. But it’s also one of the most practical Christmas gifting options. Imagine how happy your mother might be to receive a lovely box of silver plated Christmas cheese knives. So, what to do? The solution: Well, luckily for you, there are solutions to these unholy, evil, superstitious beliefs. 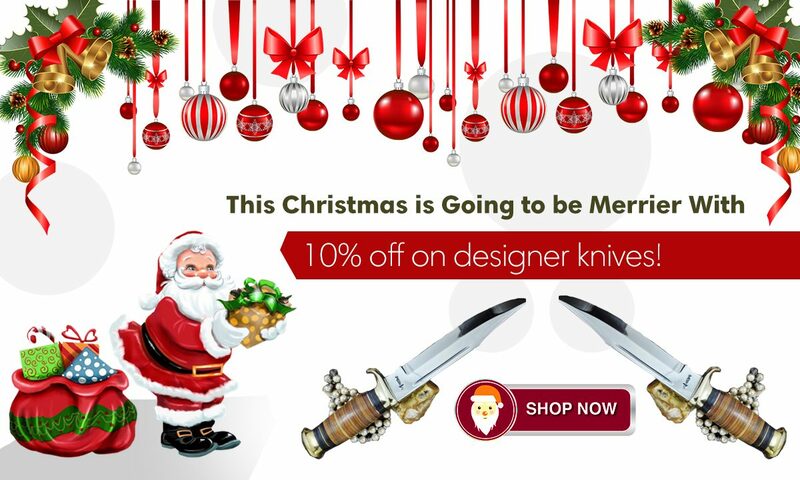 So, maybe you can gift a knife after all. All you need to ensure is that you tape a penny to the knife while gifting it. And the receiver shall promptly remove it, and give it back to you as a form of symbolic payment. This makes the gifting transactional or a type of purchase, and will release any of the bad luck and preserve the relationship. Hence, problem solved. So, now with your Christmas gift ideas sorted, you can focus on the celebrations, and of course, the sumptuous Christmas lunch. We are drooling already. We hope your stockings are stuffed with the best things ever and the angel shines the brightest at the top of your Christmas tree.